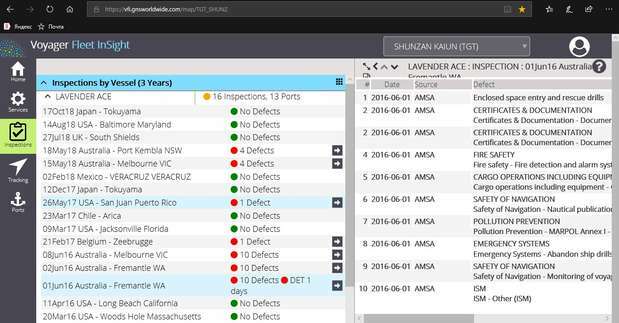 Vessel Fleet Insight (VFI) - this is an online service, which provides a wide range of information for ship owners regarding their vessels and navigation. The service contains information about ships supplied by TGT eData or Global Navigation Solutions or/and using their software. Products Onboard Collection and its flag compliance – recommendatory in nature. You can check the onboard inventory online: digital and paper publications and charts, up to a separate electronic nautical chart cell. Moreover, the date of license order and the expiry date are also displayed here. You can arrange digital and paper products collection by the edition date, the date of the last update, and the minimum flag requirements. See the products list, order history. Monitoring of ENC cells and paper charts usage (from 1 months up to 1 year period), where you can check the date of any definite ENC cell. 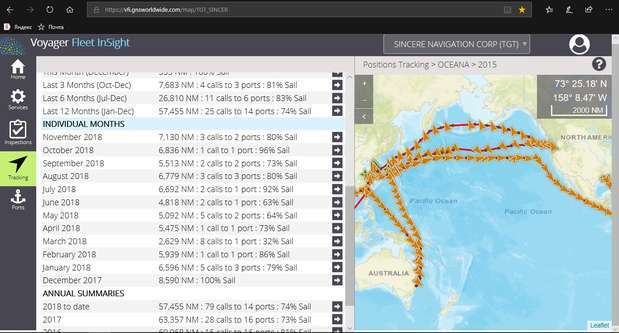 You can see all vessels’ voyages during last 12 months in a 6 hour resolution (if downloaded month by month). The data can be downloaded in xls format. Inspection history during last 3 years: the place of inspection, its date and the result (successful or not), the detention period and the reason of detention. Port Call history during last 12 months is also available.